If you know how to find triangular number and divisors of given number then you can easily solve this problem. Use below steps to solve it. Find number of divisors of triangular number that we got in step 1. If number of divisors are greater than 500, print triangular number otherwise continue. What is triangular number and how to generate it? How to find divisors of given number? 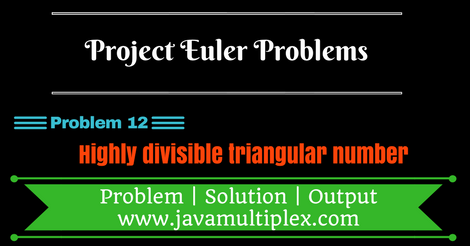 * @Problem 12 - Highly divisible triangular number. * Step 1: Find the triangular number. // Step 2: Get the number of divisors.